OSWEGO – The Friends of the Oswego Public Library and the Bookmobile will join with the Oswego Elks Club to host a pancake breakfast fundraiser on March 24 from 8 a.m. until noon at the Elks Club, West Fifth and Bridge streets. 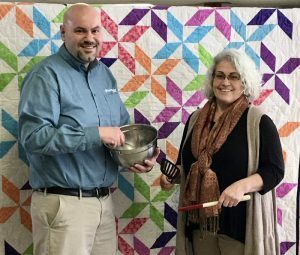 Joe McManus, president of the Friends of the library board, and Bookmobile president Susan McBrearty are pictured with the quilt donated by the United Methodist Quilt Group to be raffled at the pancake breakfast. A highlight of the breakfast will be the selection of the winner of a beautiful 68” x 80” quilt made and donated for this fundraiser by the First United Methodist Quilt Group. Quilt raffle tickets are $3 for single tickets, two for $5 or five for $10. Tickets for the breakfast as well as raffle tickets can be purchased now at the library, from any member of the Friends of the Library or Bookmobile boards, or at the river’s end bookstore. You can also buy tickets at the door on the day of the breakfast. A variety of themed baskets will be raffled at the breakfast as well as an Oswego doors poster and Experience Oswego gift certificates. Funds raised at this event will directly support the work of the Friends of the Library and the Oswego Bookmobile to promote literacy in the community.